I accidentally came across this peculiar dip at a friend's wedding last year. I was extremely hesitant to try it because of the tomatoes (just being honest), but after hours in a bridesmaids dress, I was ready to dive into just about anything. 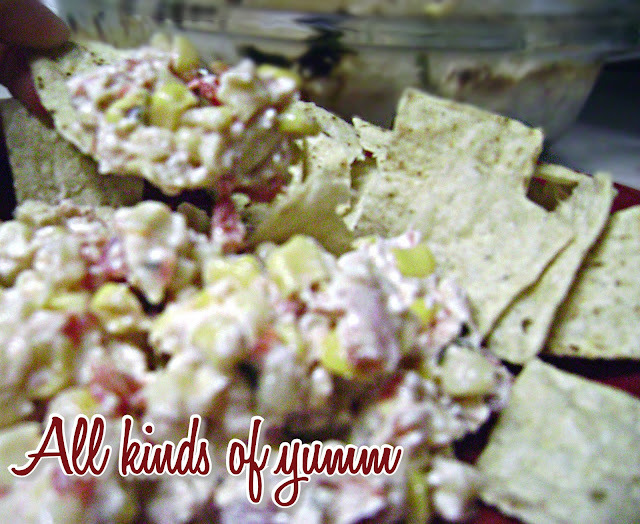 This dip is colorful, spicy, perfectly creamy and is an amazing side dish at a summer barbecue. Plus, it's super quick. And cheap. Add cream cheese dices, chili powder, garlic powder and cilantro. Combine thoroughly. Pinky promise, your guests will L-O-V-E this. This sounds uh-mazing! i will definitely try it...i don't necessarily LOVE corn by itself but i LOVE it mixed with other things!